“Freedom House,” a Non-Governmental Organization (NGO) that conducts research and advocacy on democracy, political freedom, and human rights, has released “Freedom of the Press 2013” report. According to the data, Korea was ranked 64th among the 197 countries and classified as “Partly Free,” not as “free.” Up to 1988, Korea was “Not Free” or “Partly Free,” but since 1989, Korea has been continuously categorized as “Free.” Therefore to be classified as “Partly Free” again since 2011 represents a regression to the past for Korea. The reason that the downgrading of the mainstream media of Korea is coming to light is due to its failure in performing its original functions. One of the key functions the mainstream media has to do is to give accurate, objective information. The mainstream media exists to give a variety of information from each field of society that individuals cannot collect. Furthermore, it must offer analysis and criticism of government policy, and guarantee the right of the people to have this information. However, control over the mainstream media of Korea is obstructing such functions and damaging its integrity. The main problem that arises from controlling over the mainstream media is that it forces the mainstream media give distorted information to people. Thus, the receivers of information come to understand the situation as being less serious than in actuality. It causes the public to form misinformed opinion. A recent example is the case where KBS, MBC, and SBS all rejected broadcasting about the parliamentary investigation into the NIS (National Intelligence Service). This revealed that the mainstream media of Korea is still a slave to power. August 5th, the nation’s main broadcasters, MBC, KBS and SBS notified that they would not broadcast “parliamentary investigation into the NIS in order to investigate and reveal the truth of the suspicions to intervention in the elections.” This decision caused much controversy, compared to their broadcast of parliamentary investigations into the Ministry of Justice and into the National Police Agency. In the end, the nation’s main broadcasters agreed to broadcast the parliamentary investigation postponed to the afternoon. The story from “J”, former reporter of Newspaper D presents how serious it is. He said, “Most of the mainstream media is conscious of the government because they want to pursue the interests of the company. Therefore, they do not write the article that offends government or the ruling party. Especially, conservative mainstream media does not deal with the progressive movement.” As the cases mentioned, it is already an open secret that the mainstream media of Korea is very conscious of government opinion. Also, it is questionable whether such mainstream media can give unbiased reporting. The mainstream media controlled by pressure of power has been criticized as a means of defense for government or conglomerate. Reset KBS, one of labor unions of KBS, gave some details about the situation. They disclosed that the production crew of “Documentary Three Days” was pressured to take a scene of a well which former first lady Kim Yoon-ok donated when they produced episode of “Three Days in a Rural Town of Cambodia.” It is not only government that exerts pressure to the mainstream media. The press is also damaged if it expresses criticism to conglomerates. The reports regarding the affair about the secret funds scandal of Samsung revealed that. In October 2007, Kim Yong-chul who worked in Samsung’s legal department disclosed that Sumsung had created a secret fund. After that Newspaper H reported the critical article about Samsung. Because of these articles, Samsung reduced its advertisement in "H" Newspapaer dramatically.This is one example of how the mainstream media of Korea lacks independence from power. The mainstream media is intended for the benefit of the general public. Therefore, it is a very serious problem that the mainstream media actively seeks to appease those in power. 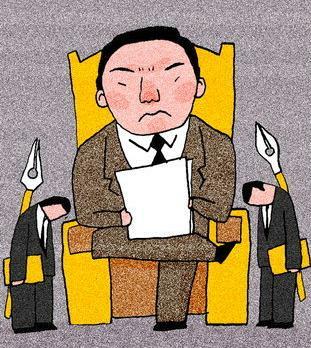 Recent cases have shown that the mainstream media of Korea is subordinate to power. As mentioned, the mainstream media often conceals or distorts something to ingratiate itself to power. Also, it is used as a means of defense for the government or conglomerates. However, what the mainstream media really has to do is to report the truth. Fortunately, movements to try to change this failing of the mainstream media that are afraid to act in the face of power are also gaining strength. The Post will discuss about such endeavors in the next publication.